I planted these ‘p-toonies’ about a month ago, and yesterday with the sun shining on them, they were so vibrant I dropped what I was doing and ran outside to capture them with my camera. 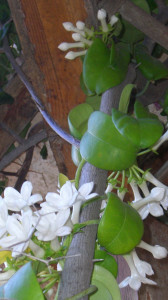 And I don’t know if you were like me, but back in High School I discovered Stephanotis blossoms in my corsage at my first prom. They are so lovely, and smell so good. Imagine my delight last year when I found a living plant at a nursery. I had myself a little splurge and planted it in a pot on the patio, where its vines proceeded to clamber up the pergola and away into the neighbor’s patio on the second floor. Ah well, I thought, it’s still a nice green growing thing, maybe when it flowers some of the smell will drift down. And then, last month, I noticed it was growing blossoms all up and down the plant. And now, every time I walk out in the back garden, I smell them…oh they are wonderful!